DSTK - Data Science Toolkit 3 is a set of data and text mining softwares, following the CRISP DM model. DSTK offers data understanding using statistical and text analysis, data preparation using normalization and text processing, modeling and evaluation for machine learning and statistical learning algorithms. It is based on the old version DSTK at https://sourceforge.net/projects/dstk2/ ChartPlotter is a New Addition to the DSTK softwares, and it allows you to build interactive Plotly JS charts and dashboards in minutes, using only mouse clicks. DSTK Studio allows you to build recommendation and prediction data products. 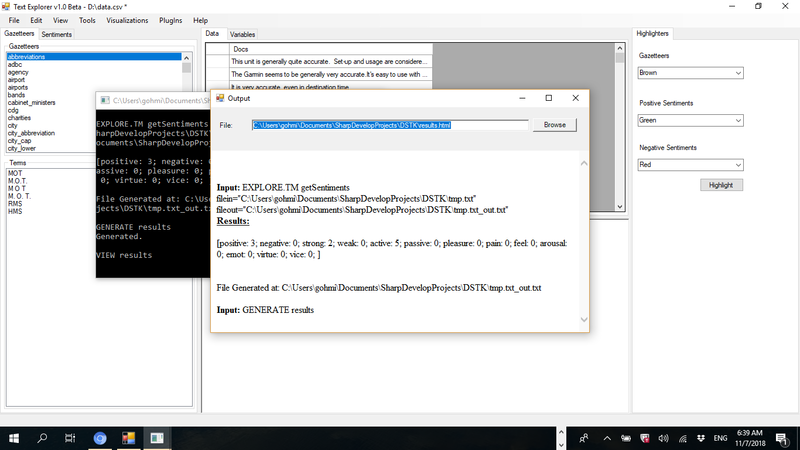 DSTK 3 consists of DSTK Engine, DSTK ScriptWriter, DSTK Studio, DSTK Text Explorer, and DSTK ChartPlotter. DSTK Engine is R simplified, focusing on Data Mining. 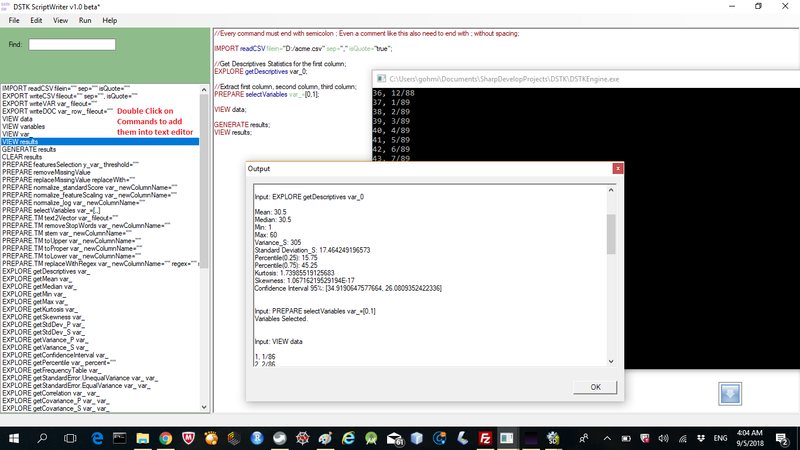 DSTK ScriptWriter offers GUI to write script for DSTK Engine. DSTK Studio offers SPSS Statistics like GUI for data mining, DSTK Text Explorer offers GUI for Text Mining, and DSTK Chart Plotter offers GUI for data visualizations. 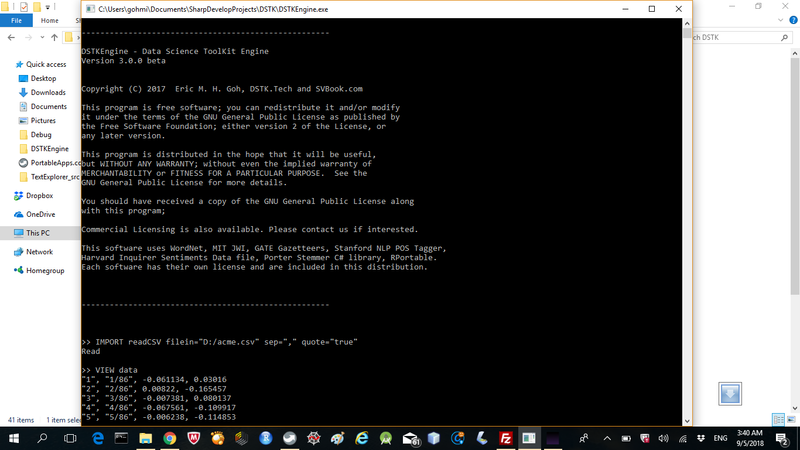 DSTK Engine and DSTK ScriptWriter are free of charge and have been uploaded to Sourceforge.net They are under GNU GPL License. For commercial license, please Contact Us. DSTK Studio, Text Explorer, and Chart Plotter, however, requires a small fee of $59 usd to help support us. 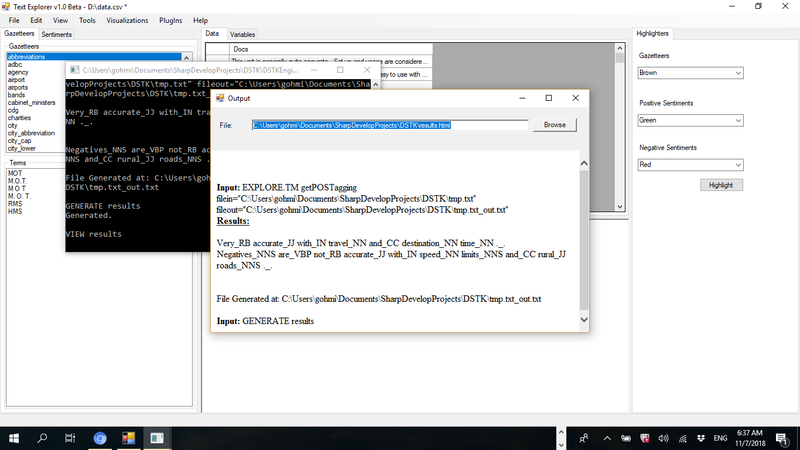 A demo version of DSTK Studio and DSTK Text Explorer is included in DSTK 3 package, but you can only use them 10 times. DSTK 3 is written in C# and Java. You need Microsoft .Net framework and Java runtime to run the softwares. 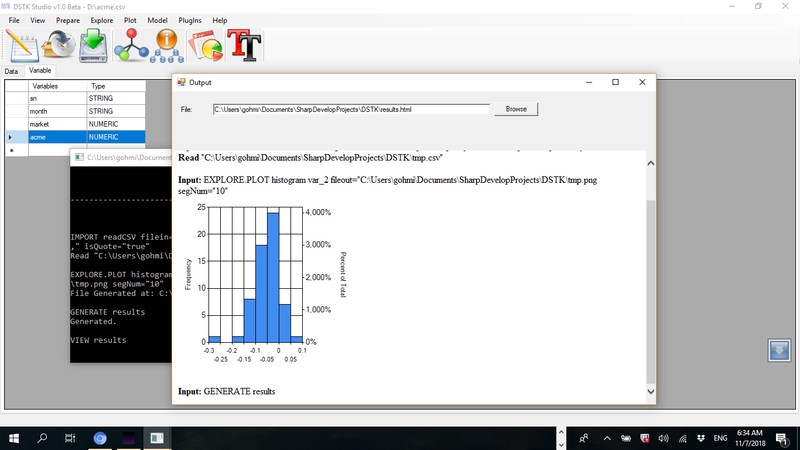 DSTK descriptives statistics, inferential statistics, and regressions has been checked and validated with R. Machine learning will be tested in future and DSTK is in beta version, hence, may have some bugs and do not have warranty. License: DSTK Engine uses WordNet, MIT JWI, GATE's Gazetteers, Stanford NLP POS Tagger, Stanford NLP Classifier, Harvard University Inquirer Sentiments Data, Porter Stemmer C# library, RPortable, Math.Net Numerics, and etc. Each have their own licenses and are included in DSTK Engine distribution. DSTK ChartPlotter is an interface to Plotly JS. 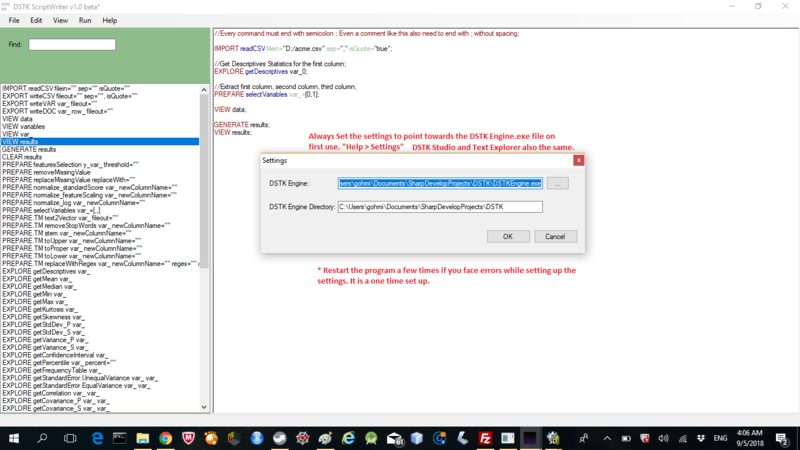 DSTK Studio, DSTK Text Explorer, DSTK ScriptWriter are Standalone softwares providing easy to use GUI to write script for DSTK Engine. DSTK 3 has no warranty, but we will take feedbacks. DSTK - DataScience ToolKit is a free software for statistical analysis, data visualization, text analysis, and predictive analytics. It is designed to be straight forward and easy to use, and familar to SPSS user. The application is written in R, Python, NLTK, Scikit Learn, and etc. The product is currently available as FREEware. JAOSS - Just Another Online Statistical System. A simple statistical system with fairly sophisticated features such as descriptive statistics analysis, inferential statistics with ANOVA and T-Test, Predictive Analytics with Neural Network. The application is written in R and Shiny, with an aim in mind to provide online access to simplistic statistical system before proceed to advanced softwares such as SPSS or DSTK. This product is currently available as FREEware. JATAS - Just Another Text Analysis System. 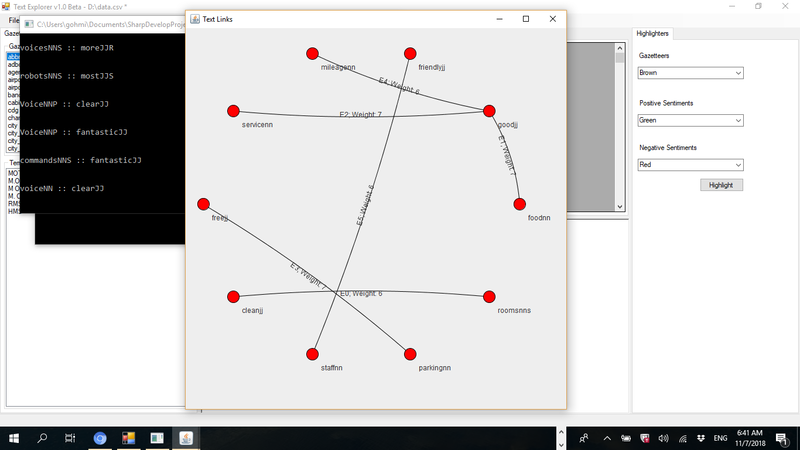 A simple text analytics system with fairly sophisticated features such as text preprocessing (stemmer, stopwords...), Visualizations, and Predictive Analytics with SVM. The application is written in R and Shiny, with an aim in mind to provide online access to simplistic text analysis system before proceed to advanced softwares such as SPSS Modeler or DSTK. 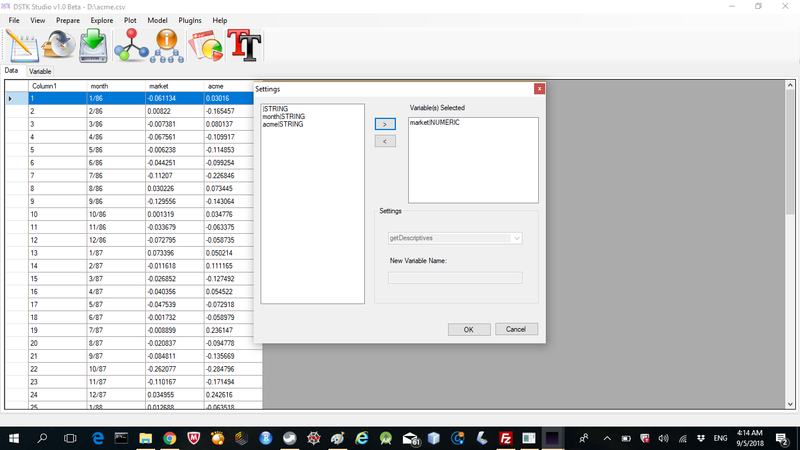 This product is currently available as FREEware..
JATI is just another interface to the Tesseract OCR engine, providing GUI interface to convert an image to text. It can do batch conversion, including converting only portion of the image into text. This product is currently available as FREEware. JAVT or Just Another Voice Transformer (formerly, it is called Just Another Video Transcriber) is a Speech Recognition software that also support text to Speech and simple media conversion. JAVT allows you to convert from video files to audio wav file using ffmpeg, and then transcribe the audio file to text using either Microsoft SAPI or CMU Sphinx. This product is currently available as FREEware.. JAWS or Just Another Web Scraper, is part of the Data Scraping Softwares developed by SVbook, alongside JATI (Image to Text) and JAVT (Video to Text). JAWS offer easy interface to scrape data from the website using regular expression, text preprocessing, or HTML Agility Pack.This product is currently available as FREEware. Enjoy. We have develop our own Data and Text Mining software at DSTK.Tech. 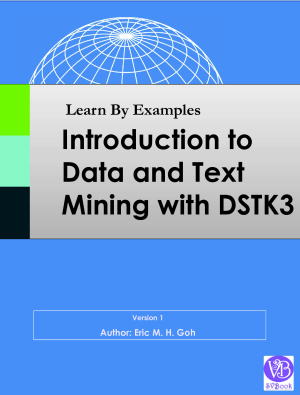 This technical book aim to equip the reader with Data and Text Mining fundamentals in a fast and practical way using our DSTK - Data Science ToolKit 3 software. There will be many examples and explanations that are straight to the point. 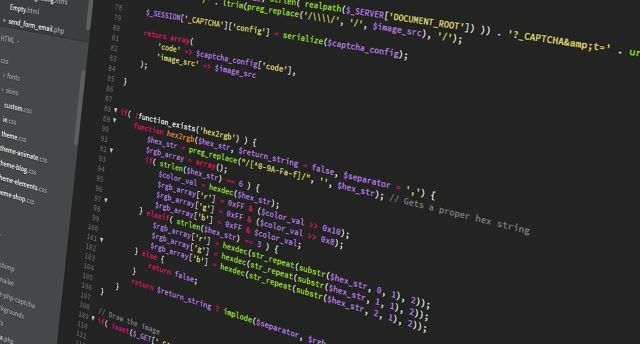 Have you ever wanted to learn data and text mining? Data Science is a very hot trend now. 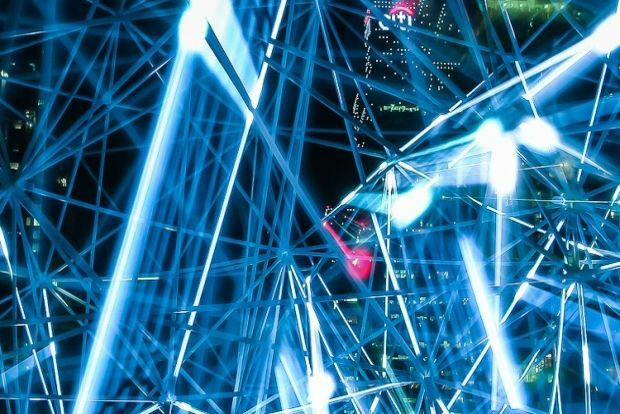 This FREE course will equip you with the fundamentals of data and text mining knowledge, with the use of our own DSTK - Data Science Toolkit 3. 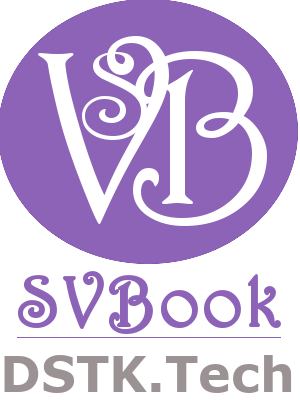 DSTK Tech is part of SVBook. Our main goal is to create useful data science technology for practitioners in both academia and business to reach fast conclusions for data science and analysis before going into deeper tools like SPSS Statistics. DSTK was designed with the user in mind, using SPSS and Excel like interface to reduce the learning curves. DSTK Engine and DSTK ScriptWriter are free of charge and have been uploaded to Sourceforge.net. 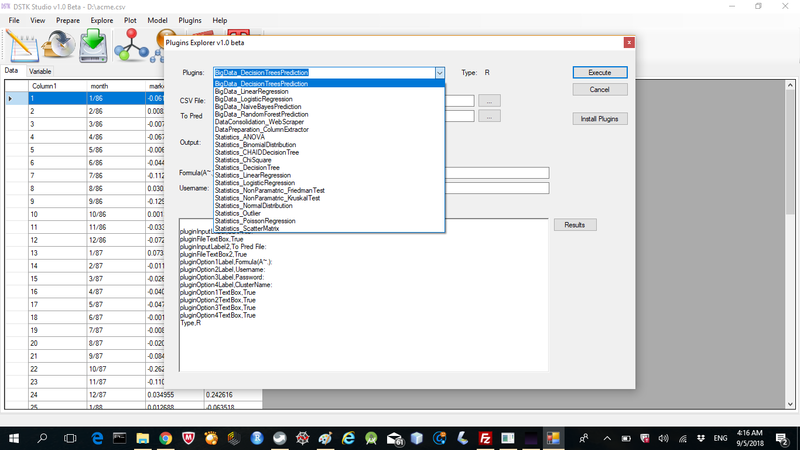 DSTK Studio and DSTK Text Explorer require a small fee of 59 usd to support us. Copyright 2017 © DSTK Tech (part of SVBook Pte. Ltd. ) - All rights reserved.